Father John Tran stands in St. Peter Catholic Church in Rockport, Texas, on Thursday. About 200 people from the Vietnamese community attend the church. Father Tran, a Franciscan priest, has been there since July 2016. Leah Oliva is Father Tran's assistant. "I helped to start the Sunday school program. Now there is no place for Sunday school," Oliva says. "The challenge will be how we are going to rebuild the church. It is important that we hold services here this Sunday, so that [Father Tran] can start communicating with the congregation." The congregation plans to gather outside its demolished church on Sunday and celebrate the first mass since the storm. Father Tran says that with his church destroyed by Hurricane Harvey, he will do what he can to hold the Vietnamese community together while it rebuilds. 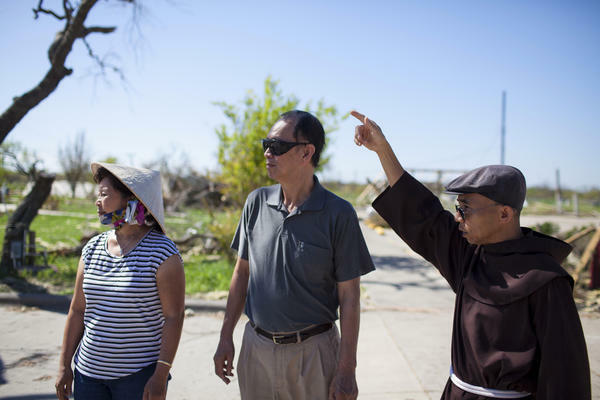 Father John Tran shows Phong Nguyen (center), and Guong Pham Hurricane Harvey's effects on St. Peter Catholic Church in Rockport, Texas. Debris outside of Long Nguyen's Fulton Harbor Bait Stand. With storm damage to the docks, Nguyen says it's too dangerous to take out his shrimp boat. Long Nguyen stands inside what is left of the Fulton Harbor Bait Stand in Fulton, Texas. Nguyen came to the region as a 12-year-old boy in 1975 with his family from An Thoi Kouc, Vietnam. 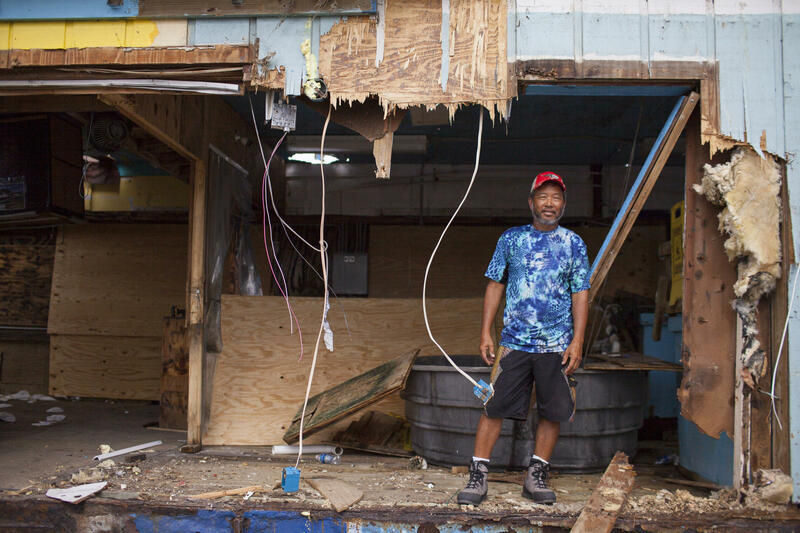 A year after his family arrived they collectively bought a shrimp boat. 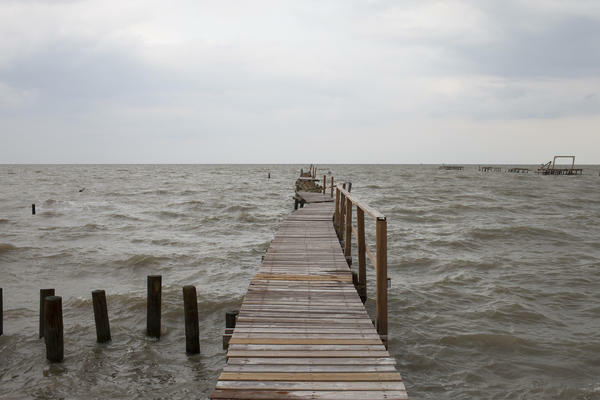 A damaged fishing dock in Rockport, Texas. Long Nguyen hopes that by Spring Break 2018, the harbor will be cleaned up and he can reopen his bait stand. Father John Tran looks through what is left of his rectory next to St. Peter Catholic Church. 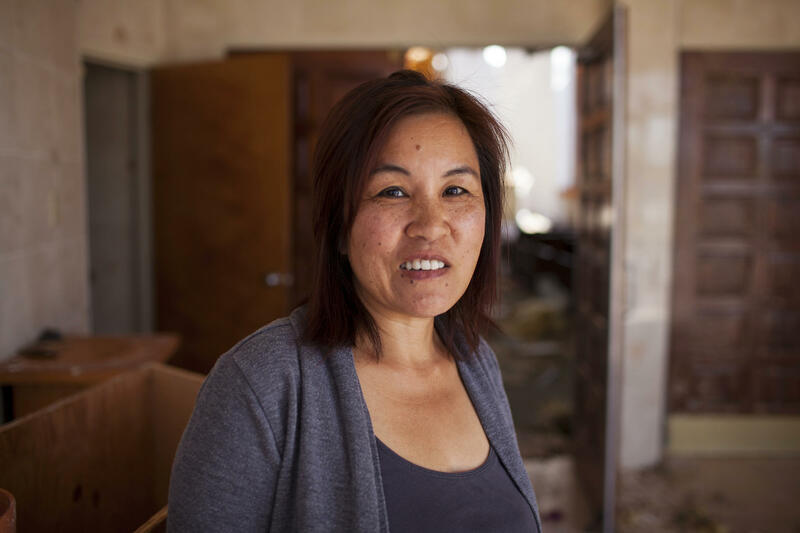 "My biggest concern is how to rebuild the church for the people," Tran says. "They have lost a lot and are disappointed. It is hard to accept." Of all the churches on the Texas coast battered by Hurricane Harvey, one of the hardest hit is St. Peter Catholic Church in Rockport. As it happens, St. Peter is the heart and soul of Aransas County's large Vietnamese population. "This used to be our church. I haven't been inside to see the devastation," said Leah Oliva, a catechist and secretary there, as she gingerly stepped over broken glass and clumps of insulation. A gulf breeze wafted through a gaping hole in the east wall. Most of the stained-glass windows were blasted away--somehow St. Martin de Porres survived. The ninth Station of the Cross—Jesus falls a third time—lay shattered on the floor. The hymnals and prayerbooks were swollen and discolored in the pews, where women once sat on the left and men on the right in conservative Vietnamese tradition. The massive wooden crucifix suspended over the altar was undisturbed--a miracle, say the parishioners who've seen it. This popular fishing village, with its famous oak trees, looks like it was fed into a shredder. But the cohesion and resilience of this coastal Vietnamese-American community, which numbers about a thousand, may help it recover from the storm's destruction. Vietnamese immigrants who relocated on the Gulf Coast have faced adversity before, having arrived here 42 years ago after the fall of South Vietnam with very little. In the early days, they worked on shrimp boats. Leah Oliva came to Texas from Saigon when she was six. "When they came here, in order to get themselves up and running, to actually build a boat, they went into their family nucleus to borrow money instead of going outside somewhere else," she said. "They borrowed money from each other and then they repaid it." With the Gulf shrimp industry in gradual decline, most Vietnamese-Americans sold their boats over the years. They opened nail salons, got teaching certificates and engineering degrees, and built bait houses. Sunlight streamed through a hole in the roof of the Fulton Harbor Bait Stand onto empty tanks of croakers, piggies, and mullet. The owners are Long Nyugen and his wife Nelda Salazar, who claim to be the only mixed couple in town. "At Christmas we give eggrolls and tamales, a half dozen of each," she says, laughing. They are still assessing the damage to their business. "The pilings on the bottom might be damaged," Salazar said, wearing an "I Survived Hurricane Harvey" t-shirt. Nguyen added, "We're gonna start all over. This building belongs to the (county) navigation district. If they supply me all the materials, I'll supply the labor." As for rebuilding the Vietnamese community, Nguyen said Father Tran is the only leader who can guide them through the difficult years ahead. "It's up to the preacher," he said, "He's the one who can pull everybody together." "A population that overcomes obstacles"
So it was with the large Vietnamese population in New Orleans East after Hurricane Katrina. In the past 12 years, almost all have returned, the incidence of PTSD is low, and people are working again. After the storm, Mary Queen of Vietnam Catholic Church was a central gathering place for organizational meetings and distribution of supplies. Moreover, the parish priest emerged as a leader. "They fared great by all standard measures of recovery," said Mark VanLandingham of Tulane University, who has studied the Vietnamese in New Orleans. He said the elders had the 1975 immigrant experience as a lens to view the calamity of Katrina. "(They said) we're a group that's going to make it. We're a population that overcomes obstacles, and I think that self concept played a really big role and gave them a collective self confidence that they're going to make it through (Katrina)," VanLandingham said. The plucky Vietnamese community on the Texas coast may have this advantage as well, but for the fact that their church has been destroyed. 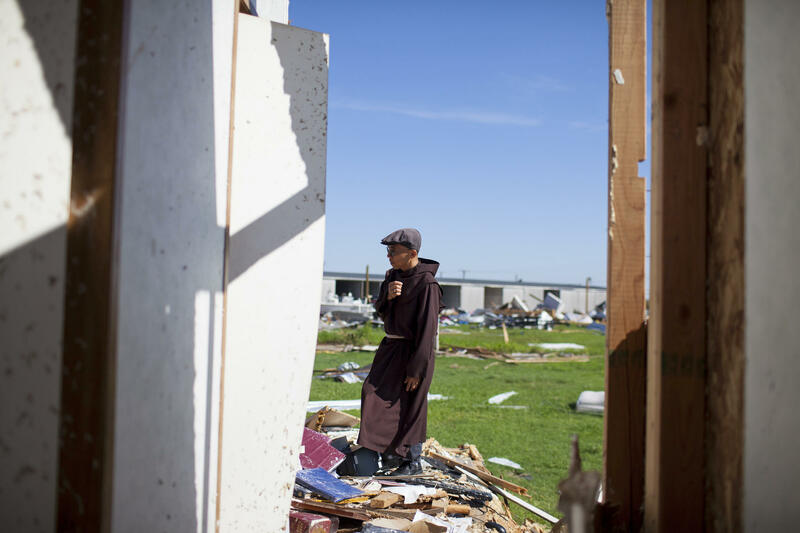 "The hurricane is testing our faith in God," said Father Tran, walking through the ruins of his mobile home rectory next door. "I went through the war in Vietnam. I was 9 years old. I saw dead bodies everywhere. After the war we survived every day, so yes, it tests our faith." 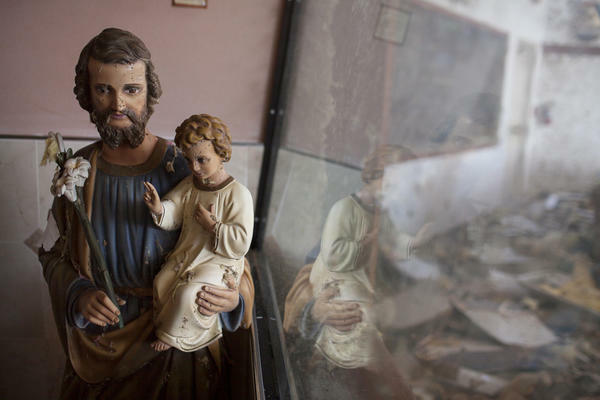 He said they plan to reconstruct St. Peter from the foundation up, but the diocese has only begun to bring in appraisers to calculate the damages. 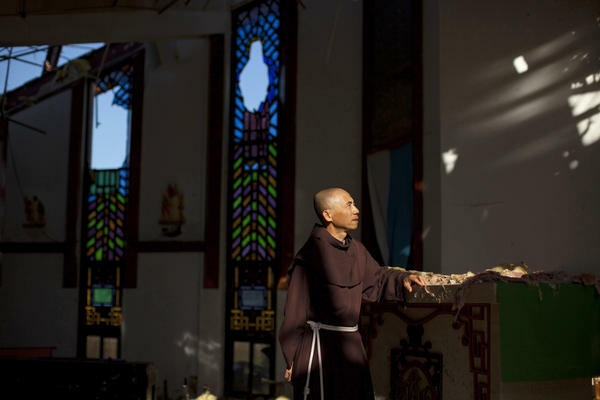 The aging Vietnamese congregation is devastated by the loss of their spiritual home. "My biggest concern is how to rebuild the church for the people," said Father Tran. "They have lost a lot and are disappointed." And now let's go to Texas for a few minutes. It might seem like it was a lifetime ago, but it was just two weeks ago that Hurricane Harvey hit Texas. Our reporters have been trying to get to as many places as they can to report on what's been happening. John Burnett found himself in Rockport, Texas, surveying what remains of St. Peter Catholic church. That church has long served the large Vietnamese community there. And John tells us it's going to be a long road back. LEAH OLIVA: This used to be our church. And it was built here, I think, in the early '90s. I haven't been inside to see the devastation, so. JOHN BURNETT, BYLINE: Leah Oliva is a catechist and secretary at St. Peter. She steps into a church sanctuary that looks like a bomb went off inside. BURNETT: A gulf breeze comes through a gaping hole in the east wall. Most of the stained glass windows are blasted away. Somehow, St. Martin de Porres survived. The hymnals and prayer books are swollen and discolored. But the massive wooden carving of Jesus on the cross hangs over the altar undisturbed. Father John Tran surveys the wreckage. BURNETT: It's going to take a while to recover. TRAN: Recover, yeah. But I know we have to accept the nature of it. We still believe God will help us, you know? BURNETT: OK, you still believe God will help you. TRAN: God is present here. We lost everything. BURNETT: The cohesion and resilience of this coastal Vietnamese-American community - that number is about 1,000 - may help them recover from the storm's destruction. The popular fishing village with its famous Oak trees looks like it was fed into a shredder. The Vietnamese have faced adversity before. They came here 42 years ago after the fall of South Vietnam with very little. In the early days, they worked on shrimp boats. Leah Oliva came to Texas from Saigon when she was six with the larger migration. OLIVA: When they came here in order to get themselves up and running, to actually build a boat, they went into their family nucleus to borrow money instead of going outside somewhere else. They borrow money from each other and then they repay them. BURNETT: With the Gulf shrimp industry in decline, most Vietnamese sold their boats. They opened nail salons, got teaching certificates and engineering degrees and built bait stands. Sunlight streams through a hole in the roof of the Fulton Harbor bait stand onto empty tanks of croakers, piggies (ph) and mullet. Owners Long Nguyen and his wife Nelda Salazar are still assessing the damage. LONG NGUYEN: We're going to start all over. Start all over. 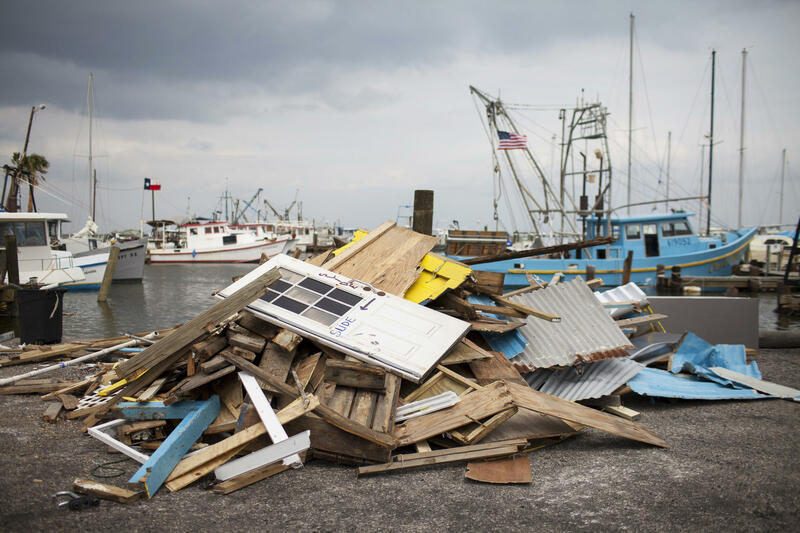 BURNETT: You're going to rebuild your whole bait stand? NGUYEN: Yeah, yeah. This the first building going to come down. BURNETT: Did you have insurance? BURNETT: As for rebuilding the Vietnamese community, Nguyen says the only leader who can guide them through the difficult years ahead is Father Tran. NGUYEN: It's up to the preacher. He's the one that pulls everybody together. BURNETT: So it was with the large Vietnamese population in New Orleans East after Hurricane Katrina. Since then, almost all have returned and everybody's working again. After the storm, Mary Queen of Vietnam Catholic Church was a central gathering place. And the priest emerged as a leader. Mark Vanlaningham at Tulane University has studied the robust recovery of Vietnamese in New Orleans. He says the elders carry with them the immigrant experience from 1975. MARK VANLANINGHAM: We're a group that's going to make it. We're a population that overcomes obstacles. And I think that self-concept played a really big role in making - kind of giving them a collective self-confidence, if you will, that they're going to make it through. BURNETT: The Vietnamese community on the Texas coast may have this advantage as well but for the fact that their church has been destroyed. Father John Tran says they plan to rebuild St. Peter from the foundation. John Burnett, NPR News, Rockport. (SOUNDBITE OF EMANCIPATOR'S "MERLION") Transcript provided by NPR, Copyright NPR.